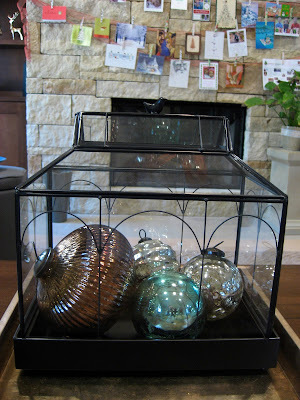 Remember the terrarium Steve gave me for my birthday, and which I filled with ornaments at Christmas? The ornaments are packed neatly in their bins in the attic, and now the terrarium is sheltering two succulents in green pots. I don't know what varieties they are (they're from Ikea, which doesn't label their plants with much specificity). The short one is Steve's little cactus, which I popped into in a coffee mug I found at Ross. It's probably the first plant we bought after we moved, so it's a minor miracle that it's still alive. It even has a couple of babies (not unlike our baby agave) peeking out from the edges of the pot. The taller one is kind of unusual. It has two sets of these flat...um...paddles (?) that are alined all in a row, and it's dark green with light speckles. The pot is from a garage sale last year, and it appears to have been painted. I don't know what color it started out, but it's perfect for this little succulent display. Between the succulents, the coordinating pots, and the fact that the terrarium was a gift from Steve, it puts a smile on my face every single time I see it.